Pisces Horoscope 2016 foretells that the year 2016 offers plenty of opportunities for growth in life for the Pisceans. It depends on your capabilities to make successful use of these openings. Pisces people will be more realistic in their approach during the year and your creativity will have to wait. The 2016 horoscope forecasts that all your ideas from the previous years are getting converted into realities this year and you will be filled with a sense of achievement. Significant growth is attained due to the influence of your spiritual strength obtained previously. People born under the zodiac sign of the Fishes have to be selective of the various opportunities that are presented to you as some of them may not suit your temperament. Take up projects which you are capable of completing. The Pisces horoscope 2016 predictions foretell that all problems with relationships experienced in the previous years will vanish during 2016. New relationships will happen between March and July. Love life will be enjoyable for both new and existing relationships in this period. Previous partnerships may disturb your love life between September and November, but stick to your current love mates for peace and harmony. Married couples will have a romantic and sexually passionate time with their spouses during the year. The 2016 Pisces horoscope forecasts show that this year is auspicious for starting new ventures and expanding existing businesses. Decisions should be taken promptly and all doubts should be kept aside. Scrutinize your projects carefully before starting, particularly before May 2016. People involved with creative arts will do extremely well and become famous in their circles. Success in your ventures will happen in the last quarter of the year. Financially 2016 is an excellent year and your monetary intelligence will not fail you. The 2016 astrology forecasts for Pisces asks you to curb your tendency to overspend in the beginning of the year. Earnings will be enough to clear pending loans in the month of June. End of the year is suitable for making new investments and for working out new methods to improve your earnings. The Pisces horoscope 2016 predicts that your health will be wonderful throughout the year. Between April and September emotional problems may create minor health disturbances. Take breaks from your hectic life frequently to recharge your vitality. Relations with family and friends will be peaceful and more on a spiritual level. Year 2016 is the right period for enhancing psychic strength with guidance from spiritual teachers. Combine your spiritual energy with the Divine force. Discover your strengths and use the lessons learned from obstacles to make progress in life. First half of the year will be exciting for the Pisceans in their journey towards self-awareness. The Pisces horoscope predictions for 2016 forecast, that planetary movements are propitious for getting rid of your undesirable traits and for boosting your natural instincts. This will assist you to accomplish your desired objectives in life without many obstacles. Your awareness will enhance your imagination and your creative talents will be prominent. You will achieve remarkable success and popularity by exhibiting your artistic capabilities to the world outside. Pisceans will get the assistance of planets in combining their physical self with the inner self during 2016. This spiritual knowledge will make your life harmonious with the environment and life will be a smooth ride. Your imagination and artistic talents will get a boost during this period. You will be interested in social causes and will work towards improving conditions of the common people. You will undergo a powerful sense of restoration of your inner energies in 2016. You can let go of things which are undesirable and there should not be any sense of guilt while doing this. The 2016 zodiac predictions foretell that you will have the help of Supreme Power with you and you should let out your inner forces for a free play. Pisces, frustrations caused by previous obstructions have to be deleted from your mind now and you can build a wonderful life for the future. If your friends are interested in spiritual healing, you should guide them. The way to inner self will be clear and the first six months of 2016 can be used to create new openings based on your previous understanding of the situation. You may face temporary hurdles in your path to progress during the year. January 2016 asks you to enjoy time with family as you will need to be refreshed for major activities in the coming months. February 2016 forecasts that you plan for the coming months. Expect changes in jobs and career. Mercury retrograde might affect your love life. March 2016 is a very confusing month for the Pisces zodiac sign. Pamper yourself with facial massages and detox therapies. April 2016 sees planet Venus influencing your love life and financial stability. Be sure to take care of your emotional and mental health. 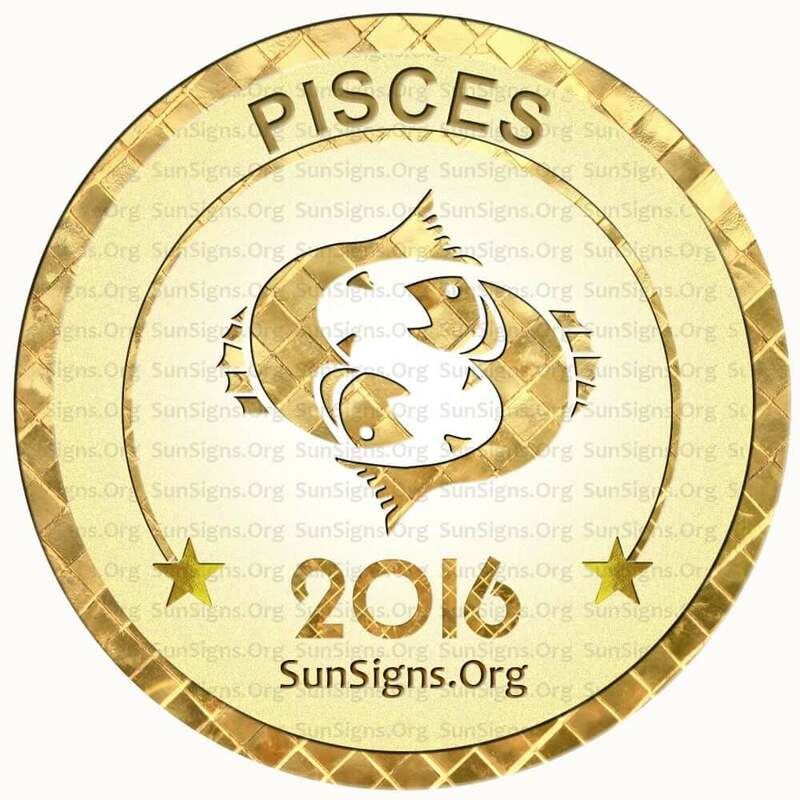 May 2016 will be excellent in terms of money and abundance, forecasts the Pisces 2016 horoscope. Singles will find love at common parties. June 2016 predicts that Pisceans will need the help of other people to progress in their career. Pay attention to joint pains and other bone related ailments. July 2016 asks you to be socially communicative, so that your hard work is paid off. You will make quick money from new methods of earning. August 2016 is a month of romance and love affairs. Marriage is not on the cards. Maintain good posture if you don’t wish to pay for it in the future. September 2016 is a month of movement and excitement. Expect to be racing towards your goals this month, suggest the Pisces horoscope 2016. October 2016 predicts that this is the beginning of a good phase in profession and career. Plan your finances well this month. November 2016 is a good month for foreign travel opportunities and promotion in jobs. This is also a good month to go on a honeymoon. This is also a good month to plan for a pregnancy. December 2016 is a month of high energy and good health. Career and finances will be on the positive side. Be ready for a love affair. The Pisces horoscope 2016 forecasts that this is an excellent year as whatever you wish for will come true. Make the right choices if you want to go ahead in life without any hindrance. This is by far the most accurate yearly horoscope I have ever read. I follow this each month and it’s always right on the dot. Who writes these? I would love to set something up and get a reading. Thank you thank thank you!